As can be seen from the first image, his left side (and not his right side) is his ice side. His left eye is also round and red. I believe there is only 1 short instance in season 2 when he activates his fire power where his left eye becomes round and red. 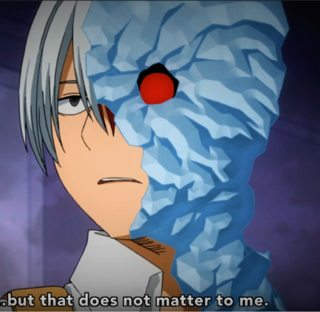 What is the reason for the difference between season 1's and season 2's Todoroki? In the first picture, it was Todoroki wearing his hero costume. In episode 6 to 8, they had mock battles wearing their costumes. It is also explained that the students can give their own design for their costume. The second one, it's in the Sports Festival where they cannot wear hero costumes because they will have an advantage to their enemies. Regarding freezing and shivering, if you're referring in the 1st picture, no, he won't freeze because that is just his hero costume, not his quirk at work. to keep himself from the effects of his half cold and vice versa. The ice on his side from season one is actually a part of his costume. 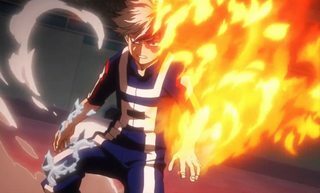 It's possible to tell because he never wanted to use his flames, so he covered the side in ice so that no one would see his father's quirk in him. What's the song during the fight between Fumikage and Moonfish in Season 3 Episode 6? What's the difference between Endeavor and Dabi's quirks? 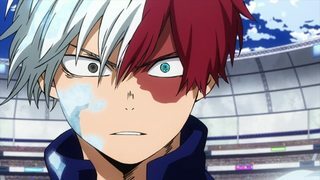 What was Shoto Todoroki attack about? What's the difference between semi-pro and pro heroes?